Welcome to our eclectic diving, ocean and marine life dictionary. If you can't find what you are looking for please let us know. Adjustable buoyancy lifejacket. The horsecollar style of buoyancy compensator. Rarely used nowadays. American Canadian Underwater Certifications. Canada's scuba certification body. Uses an audio signal to transmit information about a tagged animal as well as data on its depth, the water temperature and amount of light in surrounding water. In International maritime signal flags indicates "Diver Down". Raised in boats when divers are below the water. Used in Europe, Australia, Canada, New Zealand, South Africa and other Commonwealth countries. An air bubble trapped in a blood vessel. Might occur during too fast an ascent or if breath is held when ascending. The bubble can stop blood getting to body tissues. Migrating up rivers from the sea to breed in fresh water. American Nitrox Divers International. Specialise in training programs for technical diving and closed circuit rebreather systems. Injury to the middle ear caused by a rapid change in pressure. May result when ears aren't cleared on a descent. Buoyancy compensator device. Worn by divers to maintain neutral buoyancy. Bottom dwelling: living on the floor of the sea or lake. A solid ediface built by sea creatures, for example a coral reef. A line back to an ascent (shot) line. Useful in reduced visibility. PV = k, where P is pressure, V is volume and k is a constant. Means that if pressure decreases (such as during an ascent) then the volume of gas increases (assuming temperature is constant). And vice versa. Why you need to add air to your BCD when you descend, and release air from your BCD when you ascend. British Sub-Aqua Club. The BSAC is the governing body for the sport of scuba diving in the UK. It is a club-based organisation that offers training for members through a branch, or intensive courses through a BSAC school. Living creatures which are caught unintentionally by fishing gear. Bycatch includes those fish captured by fishers (both commercial and recreational) that are undersized, prohibited, inedible or unsaleable. It also includes dolphins, albatrosses and turtles. Migrating down river to breed in the sea. Finger-like projections on the back of a nudibranch (sea slug). Controlled Emergency Swimming Ascent. It involves finning up while exhaling to keep expanding air in the lungs from causing lung expansion injuries. It is used when a diver is out of air, and no other air source is available. The level of the lowest tide there has ever been at a particular place. All depths on a chart and heights of tide refer to it. The Convention on International Trade in Endangered Species. Confédération Mondiale des Activites Subaquatiques (World Underwater Federation of Underwater Activities). Diving agency established 1959. Species which occur around the world. Examples include hammerhead sharks, leatherback turtles and moon jellyfish. Appearing or active at twilight. Diver Certification Board of Canada. The DCBC certifies occupational divers, accredits schools which train occupational divers and presents the annual Canadian Underwater Conference and Exhibition. Also known as the bends. Caused by too rapid an ascent resulting in nitrogen bubbles which may expand and injure tissue or block blood vessels. More at Decompression sickness research archive. The angle between compass north and true north. Describes events that occur with a 24 hour periodicity. See also diurnal and nocturnal. See also "A Flag". Indicates that a diver is beneath the water. The fin running across the back of the fish. Shaped as in the diagram to the right. Global Underwater Explorers. Non-profit organisation dedicated to the training of divers as well as the study and protection of the aquatic realm. The modified arm of a male octopus or squid, used to transfer sperm to the female during reproduction. Having both male and female reproductive organs. Place on the ocean floor where a continuous flow of superheated, mineral-rich water flows up through cracks in the Earth's crust. Body chilling. A fall of more than 2 oC of the body's core temperature. International Association of Nitrox and Technical Divers. UK organisation offering training courses from Open Water Diver through to Expedition Trimix. Metres of seawater: a unit of pressure. The pressure exerted by seawater varies slightly with temperature and salinity, but for practical purposes the convention is that each meter imposes a pressure of 0.1 bar. Sometimes the convention is that each meter is equivalent to 0.1 atmosphere (0.1013 bar). National Association of Scuba Diving Schools. In 1999 NASDS merged with Scuba Schools International. National Association of Scuba Educators. Draws its experience from the fields of commercial, recreational, technical and cave diver training. 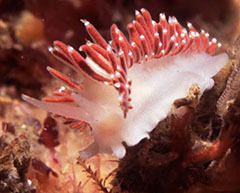 Stinging cells such as those possessed by sea anemones. From the low-tide line to the to the edge of the continental shelf - around 200 m. After the neritic zone comes the pelagic zone - or open ocean. Where a body's density is equal to the density of water in which is immersed so it neither sinks nor rises. Essential to establish when diving. When an increase in the partial pressure of nitrogen breathed causes an effect similar to alcohol intoxication. When breathing air may occur below 30 m. It is reversed by returning to shallower depths. refers to events that occur at night. Professional SCUBA Association International. The oldest technical / extended range scuba certification agency. The pair of fins at the front of the fish, behind its head. Burst lung. Caused by excess air pressure within the lungs compared to the surrounding pressure, for example if a diver ascends whilst holding her breath. Strong currents running out to sea. Also known as a rip tide. Dangerous for swimmers. Can be spotted as a rippled patch of sea when the water around is calm. If you are caught in a rip current swim across it, not against it. Scottish Sub-Acqua Club. The National Governing Body for the sport of diving in Scotland. SCUBA Diving International. Qualification agency created in 1999. It grew out of sister company TDI, which specialises in the more advanced disciplines of technical dive training. Not a charity to help the seabed (although perhaps there should be one called that) but the terrain or topography of the seafloor. Officially steep-sided extinct volcanoes beneath the ocean surface at least 1000 m hight. Divers call any tall, underwater, peak a seamount. A line to descend or ascend along. Hard, needle-shaped, calcium carbonate skeletal structure contained within soft corals. Also known as a sclerite. Smart position and temperature tags. Record, for example, temperature and depth, and send logged data to satellites at regular intervals. Used on animals who spend time at the surface, like dolphins and turtles. Scuba Schools International. In 1999 SSI merged with the National Association of Scuba Diving Schools. Casued by waves formed by past wind, or wind at a distance. Abrupt temperature gradient between the warm upper layer of water and denser cold water below. The difference in height between high and low water. 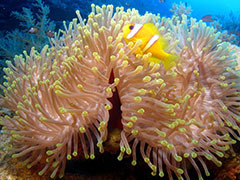 The system used to describe fringing coral reefs. These reefs are commonly have six distinct areas (or zones): shore, back reef, flat reef, reef crest, fore reef and drop-off. 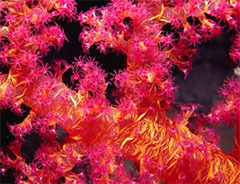 Microscopic algae that live in the tissue of reef-building corals. Pronounced zoo-zan-thelly. Is there a diving or marine term we've missed that you would like explained? Let us know.